Imagine yourself surrounded by the crystal clear ocean with hundreds of fish schooling around you. Out of the dark the silhouette of a shark appears and slowly cruises past you, above the large stingrays glide over. In an old shipwreck eels peek out of their holes waiting for their next meal to swim past. 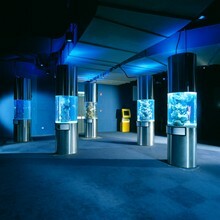 This is our Aquarium Experience, one that takes you from the rivers and streams down into the deep dark ocean. There is no other experience like it! Below are the exhibition features that we can custom build into our aquariums. Our unique curved acrylic tunnel takes the public on a magical tour with panoramic views in every direction. This particular viewing system has been designed to view the Underwater World from a Diver's Perspective, this design also allows children to get a close-up view of some of the smallest sea creatures. Oceans, seas, rivers and lakes cover two thirds of the earth’s surface and all contain unique eco-climates and specialist habitats. Using the 3 E’s philosophy “Environmental Education through Entertainment” we are able to capture the public’s natural curiosity of these environments enabling them to learn and explore at their own leisure, this making it a memorable and rewarding experience. This concept has been introduced into Turkuazoo Aquarium in Istanbul...It remains the next great leap in aquarium viewing technology and an opportunity to view the underwater world in a large format window. This is a popular attraction throughout the aquarium world. We give the visiting diver an experience they will never forget! We design each aquarium in a bespoke manner suited to the locality that each project is based. The Immersion experience is based on a presence of being completely surrounded in an artificial/real environment so as to best simulate the natural world. This is particularly important for the visitor to appreciate the wider natural world, and how important it is to keep it intact for generations to come. With a successful educational philosophy Marinescape provides a classroom and Back of House Tours available to local schools and other organizations. Fulltime teaching staff develop programs alongside local educational authorities. Lectures would be supplemented by tutorials, microscopic examination of marine life and practical studies in the wet laboratory. Children learning about the aquatic environment is important for the survival of the oceans, rivers, lakes and streams of the world. We have adopted children's education areas into the aquarium designs and encourage all scopes of learning throughout the ages. We have installed education kiosks in several aquariums which has proven very successful. These kiosks are a great way for students and enthusiasts of any age to gain knowledge in the Aquatic environment. 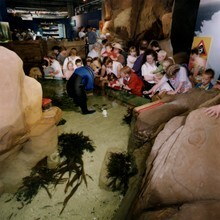 Traditionally, the viewing of aquatic life was confined to aquariums where the viewers move around a series of small glass tanks displaying different species of aquatic life. These tanks generally had a cloudy appearance due to poor water quality, this made for an uninteresting experience for the viewer and unhealthy life for the fish. 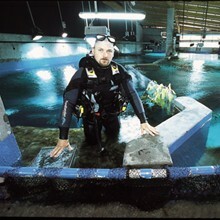 However in January 1984, Ian Mellsop, Civil Engineer and Managing Director of Marinescape opened the world's first walk-through aquarium in Auckland, New Zealand altering the old format forever. What separates us from other aquarium developers? 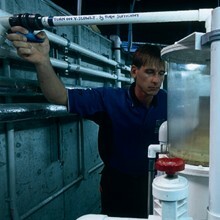 We are the only aquarium developers in the world to offer a complete turn-key service. 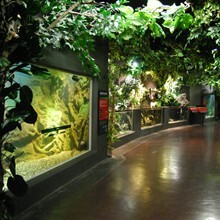 This ensures the aquarium is developed and managed to the highest specification. We are the leading specialist in the design and build of For-Profit Aquariums, with the success of over 24 projects to prove this. 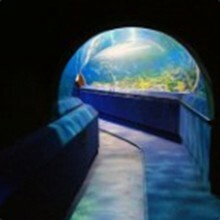 Our Concept gives the visitor a divers eye view by taking them underwater through the SeaTube™, a horizontally curved acrylic tunnel meandering through a large ocean tank. Our aquariums are dominated by a main tank where a complete eco-system is established giving the visitors a clear understanding of the marine environment. Rock formations carefully designed to maximise visitor exposure to all facets of life and activity in the tank. Visitor movement within the tunnel is regulated by a moving walkway, while a fixed platform provides the opportunity for prolonged viewing. Large Sharks and Rays are a key attraction of our aquariums, with a design to allow sharks to maintain their natural swim-glide pattern. We are innovative in our approach and are continually upgrading our concepts to include cutting edge technology with many "world first" ideas to our credit.